The state of your house has a huge impact on the state of your mind, so we’ve got some top tips on how to make cleaning as easy as possible when you’re struggling. At the end of a hard day – at the end of any day really – the last thing I want to do is pull on a pair of marigolds and clean the house. If I’m stressed, tired or feeling down then I’m doing well if I make it through an episode of Gogglebox, so cleaning definitely isn’t going to happen. The downside of crawling into my fortress of mess is that then not only do I feel bad for not doing any tidying, living among all the clutter also makes me feel rubbish. When I finally muster the energy to tidy up I always feel better but there’s no telling me that when I’m staring at a week’s worth of dishes. Mess is a common symptom of being stressed or depressed, but it’s also something that leads to both of those things, which means it can easily become overwhelming and end up spiralling out of control. On the plus side, the opposite is true too. Cleaning can make you feel good and a clean house has a positive impact on your mental health. While this sounds like totally useless advice because if you had the energy to clean you’d probably already be doing it, the good news is it’s easier to turn things around than you’d think. Firstly, break up the tasks into smaller chunks and don’t try and tackle the whole house all at once. Experts say doing 20 minutes of physical activity a day is really good for the mind. 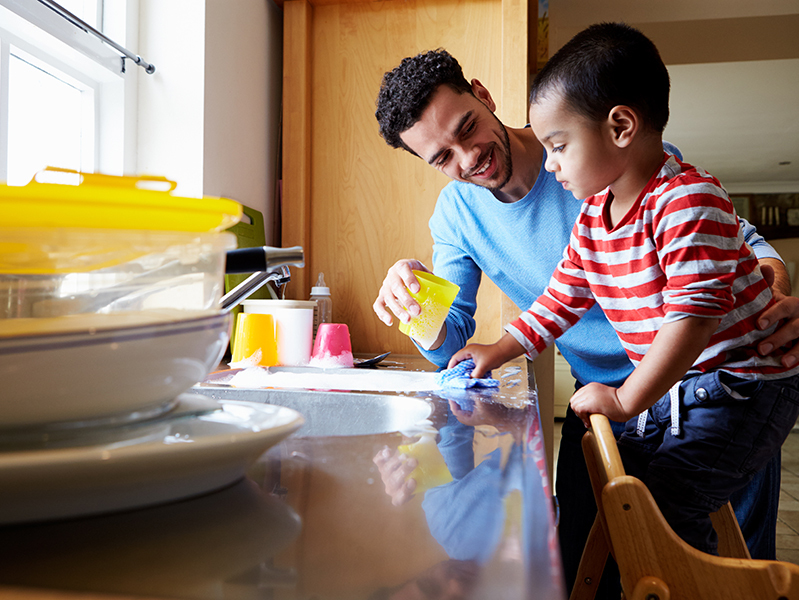 If that activity tackles the housework too – like enthusiastically hoovering the living room floor – then even better. Pick one room and do a little bit on it each day until it’s in a better state, and then pick another area. If 20 minutes is too much, then just do five minutes, or two. Wash up one mug if that’s all you can manage – who cares, you’re doing great. Celebrate the wins, no matter how small. Make tidying part of your routine if you can. The only way I manage to keep on top of the washing up is if I spend five minutes doing it as soon as I get home from work before sitting down. Making it a regular habit helps it seem less daunting and stops me overthinking the jobs. Keep cleaning products in easy reach, such as three staple products by the sink, so you don’t have to hunt through cupboards before you can start cleaning. Nobody has time for that. Another top tip is to prioritise important areas like the kitchen and bathroom. The spare room and under the stairs might be stuffed with things itching to get tidied but just quietly close the door and come back to them when you’re up to it. When you’ve got an overflowing laundry basket and every kitchen surface is a mess it’s tempting to try and blitz it all the moment you get some energy back. Try to stick to a steady pace though, otherwise you’ll tucker yourself out and end up right back at the start of the cycle. Delegation is a beautiful thing when it comes to cleaning. Get your partner, kids, housemates or best mate to help because it’s almost definitely their mess too. Sometimes housework just isn’t going to happen and that’s fine. Feel good about anything you manage and don’t be too hard on yourself if you don’t do as much as you wanted. Hire help if you’re really struggling and can afford it, or ask friends for support because it’s free and as mortifying as it might feel, they genuinely won’t mind. I’ve nipped over to clean for friends when they were feeling low before and was just happy I could be useful. Make the jobs feel as little like cleaning as humanely possible. Put on some music, a podcast or the TV or call the aunt you never get round to catching up with while you work. Even better, use it as therapy and just take out all your frustrations on those grubby tiles. Another good tip I’ve seen is dimming the lights while you clean so you can’t see all of the clutter. Any little hacks that help life seem a bit less overwhelming should be embraced wholeheartedly with two marigold-covered arms. Finally, and most importantly, if you’re struggling with your mental health contact your GP for advice.